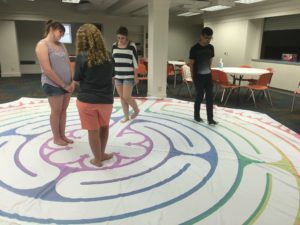 Labyrinth is a progressive Christian community that is LGBTQ-friendly, racially inclusive, and open to all students, whether atheist, questioning, or devout. Whether you’re a long-time believer, or hopeful skeptic at best, spirituality in college is a journey with twists, turns, and dead ends. You have questions and beliefs, doubts and dreams, and school work to go along with it. Here at Labyrinth, we welcome and encourage you on your journey by providing a safe place to ask questions about God, explore and grow in your spirituality, and connect with other students. College can feel like a maze — we can help you find your way. Amelia Fulbright is our Campus Minister and Executive Director. College was an important period of spiritual growth and awakening for Amelia, and she hopes to create safe space for students to experience a similar kind of awakening in their lives—through exploration, community, and social justice action. In addition to her work as a pastor, Amelia has previously worked in community mental health services and as a domestic violence crisis counselor. Amelia has a wide range of interests, including a special affinity for feminist theologies, contemplative spiritual practices, holistic medicine, and bluegrass music. She is also happily married and enjoys being a mother to her daughter, Vivienne. Luke Leverett is our Director of Music and Media. Luke is a singer/songwriter, guitarist, music instructor, father, and writer. Luke says, “I never think of myself as a starving artist, but a hungry artist. My songs are about being in between, and I am.” Luke leads us in worship with music from old hymnals, new song books, and original music. Anna Strickland is our Program Assistant. Anna is an alumna of Labyrinth, having graduated from the University of Texas in 2010 with her degree in Applied Learning and Development. She is currently pursuing her Master’s of Divinity from Iliff School of Theology. As an artsy type, Anna brings creativity to our worship services and meditation group.